The fight for West Papua might be far from a victory for people there but at last week’s 48th Pacific Islands Forum Leaders Meeting; the vocal local protesters who made the issue known can claim a moral victory. The mere fact it was acknowledged in the official communiqué is a step in the right direction. Some people might say it is not enough but it must be said that small steps are better than no step at all. On the other hand, for allowing the protest to proceed – barring an incident where protesters were asked to produce a permit – the government of Samoa can also hold its head up high that it allowed a basic freedom in a democracy to be exercised. The fact that the protesting group was allowed to express their views without having anyone dragged into Police cells, as we’ve so often seen in these things, is a good sign for Samoa. The only downside was the Police demanding a permit when from what we’ve been told such a permit is not required. We are not lawyers but this is perhaps something that needs to be clarified in terms of going forward. Whether the Police made a mistake, someone should own up and acknowledge that. What we do know is that the second protest went ahead unopposed. We say this because wherever protests are involved, there is no guarantee that there will be no confrontation. 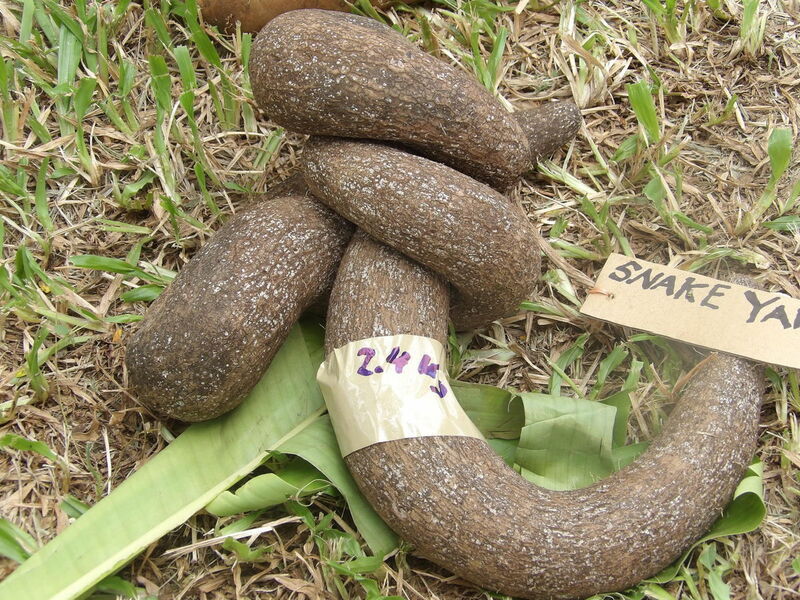 In countries near and far, we’ve often seen these confrontations turn ugly, extremely ugly. Yet in Apia last week, while it did create a scene, common sense prevailed in the end for the sake of Samoa and the preservation of democracy on these shores. The mere fact that the Secretary General of the Pacific Islands Forum Secretariat, Dame Meg Taylor, made an appearance to acknowledge the views of the protest group speaks volumes about the mutual respect we have in the Pacific. She could’ve just ignored them but she didn’t. What’s more, the recognition of the issue in the official communiqué is even more encouraging as it means the issue of human rights abuses in West Papua is not being ignored, as some people say. Interestingly enough, this completely throws Indonesia’s official response to the protesters out the window. Last week, an angry Ambassador of Indonesia to New Zealand, Samoa and Tonga, Tantowi Yahya, criticised the protest. “The Pacific community should stick to the main agenda of the conference which is the Blue Pacific. You know everything is connected to that,” he said. A colleague of the Ambassador, Mr. Joku became angry and raised his voice to journalists present. “No! We just stick to the main agenda… but not the Papuans,” he said insisting that the Forum is not the place for the issue. Perhaps someone should have reminded both Mr. Yahya and Mr. Joku that this is not Indonesia. This is Samoa where people are allowed to express their views and opinions. Besides, who gave them the right to dictate what can and cannot be discussed in the Forum? Folks, this is the Pacific Islands Forum after all held in Apia where Samoan people are free to do whatever they want in their country. The protest last week was perfectly legitimate because the last time we checked, we are a free people who are allowed to protest and express ourselves freely. So good on the protesters for exercising their freedom. Let’s hope the momentum is not lost and that at the next Forum meeting, the issue of human rights abuses at West Papua will feature a bit more prominently in the communiqué and that officials like Mr. Joku and Mr. Yahya will learn to leave their dictatorship mindset in their country. Apia, Jubi – Forum Kepulauan Pasifik (PIF) ke-48 telah rampung di Apia, Samoa dari tanggal 5 – 8 September 2017 dan dihadiri oleh Kepala Negara, Pemerintahan, dan Wilayah dari Australia, Kepulauan Cook, Negara Federasi Mikronesia, Polinesia Prancis, Republik Kiribati, Republik dari Kepulauan Marshall, Republik Nauru, Kaledonia Baru, Papua Nugini, Samoa, Kepulauan Solomon, Tonga, Tuvalu dan Vanuatu. 4. Para pemimpin kembali menegaskan Framework for Pacific Regionalism (Kerangka Regionalisme Pasifik; FPR) sebagai platform komitmen yang diperbaharui terkait tindakan kolektif untuk mendorong agenda kawasan ini menuju realisasi visi wilayah yang damai, harmonis, aman, inklusif secara sosial, dan makmur sehingga semua orang Pasifik dapat menjalani kehidupan yang bebas, sehat dan produktif. 5. Para pemimpin menegaskan kembali rasa kepemilikan atas agenda regional melalui proses pengembangan kebijakan yang inklusif dan transparan. 6. Para pemimpin mendukung identitas Blue Pacific (Pasifik Biru) sebagai pendorong utama aksi kolektif untuk memajukan visi para Pemimpin di bawah FRP. Dengan mempertimbangkan perubahan konteks global dan regional, Para Pemimpin mengakui bahwa identitas The Blue Pacific dapat memperkuat potensi kepemilikan bersama Samudra Pasifik dan menegaskan kembali hubungan masyarakat Pasifik dengan sumber daya alam, lingkungan, budaya dan mata pencaharian mereka. 7. Para Pemimpin lebih dalam mengilhami The Blue Pacific sebagai sesuatu yang berhubungan dengan semua masyarakat Pasifik yang terdiri dari samudera kepulauan kita, yang menyadari kebutuhan dan potensi mereka, yang merencanakan dan memiliki agenda pembangunan, dan yang dapat bertindak secara kolektif demi kebaikan semua, daripada kebaikan sendiri. 8. Para pemimpin menegaskan kembali dukungan mereka terhadap kebijakan dan deklarasi lautan regional yang ada, serta penguatan Pacific Ocean Commissioner (Kantor Komisi Samudra Pasifik) untuk mengkoordinasi dan mengadvokasi isu-isu sektor kelautan. 9. Para pemimpin berkomitmen mempercepat pengembangan kebijakan untuk melarang penggunaan kantong plastik, kemasan plastik dan sterofoam sekali pakai dan meminta semua mitra Pacific Rim untuk bergabung dan berkomitmen dalam menangani pencemaran laut dan sampah di laut, untuk menjaga integritas lingkungan perairan di Samudra Pasifik untuk manusia, planet dan kemakmuran. 10. Para pemimpin menyerukan upaya regional terpadu yang menyusun dan menetapkan pengakuan internasional akan perlindungan permanen dan integritas zona maritim dan kedaulatan, dari dampak perubahan iklim dan kenaikan permukaan air laut. Tiga poin (11 – 13) dimana para pemimpin menegaskan bahwa mereka adalah bagian dari arsitektur regional dan pendorong prioritas regional dan alokasi sumber daya, serta mendorong donor dan mitra kawasan Pasifik untuk menyelaraskan sumber daya mereka untuk memenuhi agenda forum. Dua poin (16 dan 17) dimana para pemimpin mengakui kemajuan yang dicapai oleh Fisheries Task Force (Satuan Tugas Perikanan) dalam melaksanakan program kerja yang disepakati, dan mencatat perlunya koherensi kebijakan tingkat nasional untuk mendukung posisi kebijakan regional. Dan para pemimpin mencatat keprihatinan terhadap negosiasi usaha pengelolaan tuna tropis yang baru di Komisi Perikanan Pasifik Barat dan Tengah untuk mencegah manajemen berbasis zona. Delapan poin (18 hingga 26) termasuk betapa signifikannya kerentanan dari negara-negara Forum terhadap dampak buruk perubahan iklim, para pemimpin menyerukan adanya usaha mendesak dan ambisius dari masyarakat global untuk mengatasi perubahan iklim. Para pemimpin mendukung aplikasi Anggota yang memenuhi syarat ke Dana Iklim Hijau, termasuk di Nauru. Para pemimpin mengakui penandatanganan PACER Plus pada tanggal 14 Juni 2017 di Nuku’alofa, Tonga, sebagai pencapaian penting dalam sejarah. Tiga Poin (28-30) termasuk para pemimpin mendukung tindakan bilateral, regional dan multilateral untuk membantu Republik Kepulauan Marshall dalam upayanya melibatkan Amerika Serikat menuju resolusi yang adil akibat Program Percobaan Nuklir A.S.
Empat poin (31-34) termasuk para pemimpin mengakui pentingnya memperkuat kerjasama dan berbagi informasi dalam domain maritim. Pemimpin juga menyadari pentingnya menangani masalah keamanan dunia maya. Para pemimpin mengakui keterlibatan konstruktif negara-negara Forum dengan Indonesia sambil mencermati pemilihan umum dan hak asasi manusia di Papua Barat dan Papua serta terus melanjutkan dialog secara terbuka dan konstruktif. *Untuk daftar Maklumat dan semua poin yang lebih lengkap dapat dilihat disini. 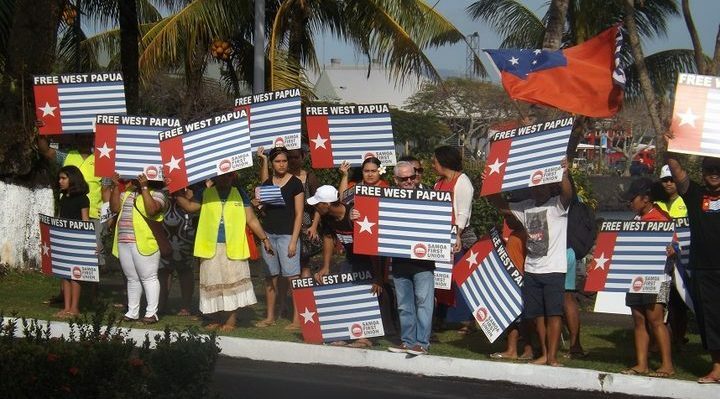 Radion NZ )nternationa – Indonesia’s Ambassador to Samoa, Tonga and New Zealand, Tantowi Yahya, says protesters supporting West Papua independence should have sought a government permit of approval to stage the action. 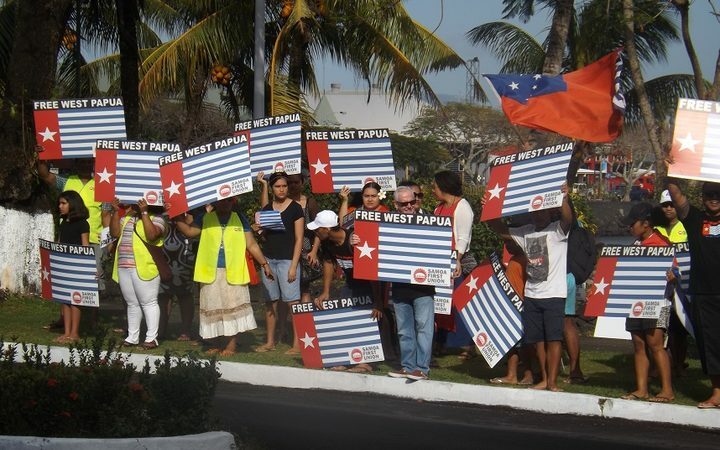 At least 30 local people supporting the West Papua independence movement took part in a peaceful protest this week in front of the hotel where the Pacific Island Forum leaders summit is held in Samoa. A member of Mr Yahya’s delegation also accused one senior journalist of asking provoking questions in support of the West Papua issue. The Ambassador said the reporter’s questions were based on outdated information. West Papua was one of the issues raised by the civil society delegation in this week’s Forum leaders meeting. But Ambassador Yahya said the issue of Papua was not on the agenda at this Forum meeting. “First it will not bring any relevant issues which connects to the agenda and the second, it’s kind of, in our perspective talking about Papua in this conference is not in place because from the begining there is no agenda as such that will be concerning the issue of Papua,” he said. Meanwhile, Indonesian foreign affairs official Franzalbert Joku accused the Pacific Island countries, Australia and New Zealand of failing to help West Papuans when they needed help. Mr Joku, who is in Samoa because Indonesia is a Forum dialogue partner, said the Forum meeting is not the place to raise the West Papua issue. He said Pacific Island countries were now questioning West Papua’s integration into Indonesia in 1969 when the process had been relegated to the history pages. Mr Joku went on to say West Papuans had never seen Samoans and Fijians, adding they should not pretend that they wanted to help. Pacific Islands countries most critical of Indonesia’s West Papua policy, such as Solomon Islands and Vanuatu, didn’t become independent before 1978. The Indonesian delegation is among other Pacific Island Forum dialogue partners, such as the United States, China, and Japan. A senior staff member of Indonesia’s Ministry of Foreign Affairs, Franz Albert Joku, has rubbished the peaceful protest highlighting the plight of West Papua at the 48th Pacific Islands Forum Leaders Meeting, this week. Mr Joku was accompanied by the Ambassador of the Republic of Indonesia to New Zealand, Samoa and Tonga, Tantowi Yahya, during a press conference where they responded to the protest. Ambassador Yahya said the protest concerned them greatly. “The Pacific community should stick to the main agenda of the conference, which is the Blue Pacific. You know everything is connected to that,” he said. Mr Yahya said their concern is that the protest could have overshadowed the main agendas of the conference. “No! 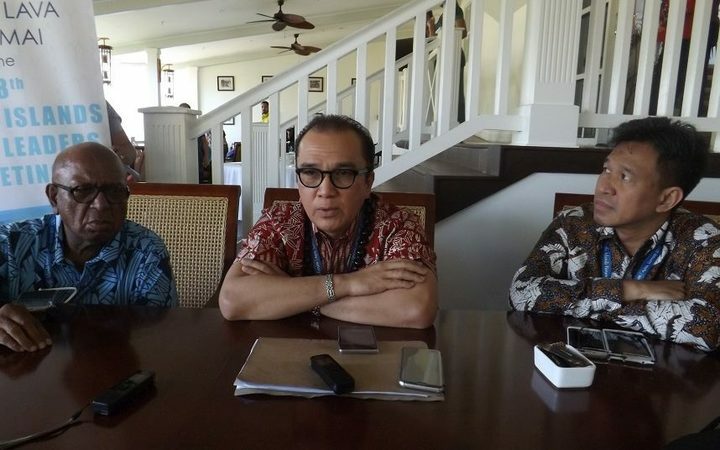 We just stick to the main agenda… but not the Papuans,” Mr.Yahya said. Mr Joku intervened noting the West Papua issue is not new to the Pacific. 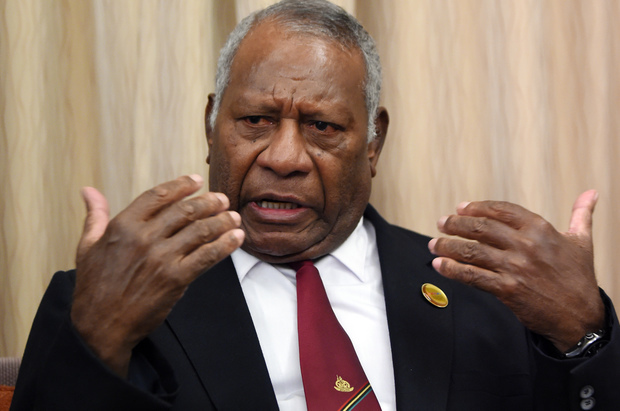 “It’s regrettable that Pacific Islanders all of the sudden want to address the Papua issue, now,” he said. 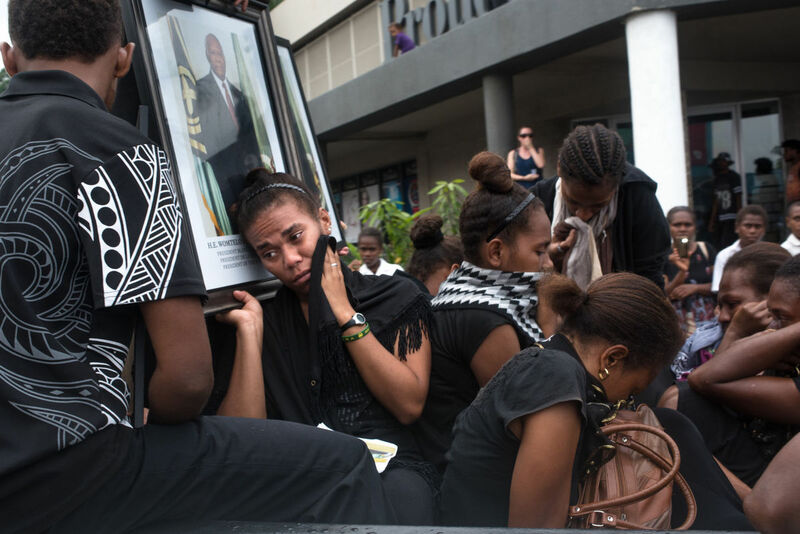 “The Papua issue has been at the forefront since the late 50s and early 60s. “We have seen our worst; where the hell were the Pacific Island nations when we really needed that kind of expression and that kind of concern coming from them? “Now they are questioning the Independence and Colonisation referendum for Papua that have been relegated to the history pages. A lot of constitutional changes have taken place since. Mr Joku insisted the forum is not the place for the issue. “Papua is very close to our heart and we will not be dictated by anyone. We Papuans, in Papua, will decide what we want to do. “We’re under going constitutional mechanism and constitutional changes, we want to empower ourselves constitutionally, politically, economically and socially. When we needed the Pacific, when we needed Australia and when we needed New Zealand, you have not come to our aid. Mr Joku added, “We’ve never seen Samoans and Fijians. And don’t pretend you want to help us. We know what we want. Have a balanced article and invite them to visit West Papua. “You feed yourself with what you read on the internet, we invite you to come to Indonesia. 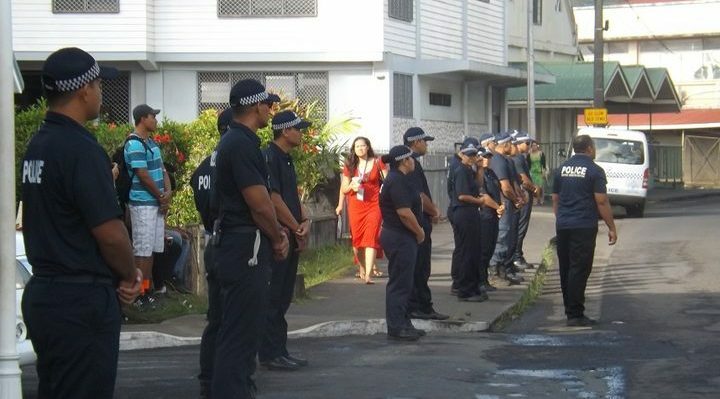 Police disbanded about thirty protestors demonstrating outside the meeting venue in Samoa’s capital this morning. “Just letting him know that we are going to have a protest this afternoon. Around 30 protestors supporting West Papuans’ self-determination were moved on by police this morning as they tried to demonstrate outside the Sheraton Samoa Aggie Grey’s Hotel. Mr Mika, who’s a spokesman fro Samoa’s First Union, said it was not clear why the meeting was disbanded and they had asked the police for clarification.